What I do: I read the manuscript, doing as much or as little editing as I’m asked to while keeping the author’s intentions for the story in mind. (If you tell me you don’t want me to fix any awkwardly worded sentences in your manuscript, I’ll leave them alone. I’ll grit my teeth and drink more coffee than usual, but I’ll abide by your wishes, because the author has the final say.) I prefer to take a non-invasive approach to editing. I correct spelling and punctuation, and suggest a better word where the one used just doesn’t fit. I point out places where the plot doesn’t make sense or where the story slows in a way that doesn’t seem to serve the overall pacing. I fact-check. Unless the author requests otherwise, I use the rules/guidelines found in The Chicago Manual of Style. What kind of fiction I proofread/edit: I specialize in science fiction and fantasy. I’m willing to look at most other genres of fiction on a case-by-case basis. I will not edit erotica or religious propaganda. Substantive/developmental editing: Plot, characterization, pacing, worldbuilding: the big-picture stuff. This comes first. If the story isn’t what you want it to be yet, the comma glitches can wait for the final version. 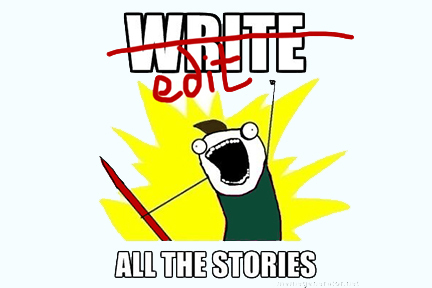 I am not comfortable doing this kind of editing on non-SF/F writing. Line editing/copyediting: Word choice, clarity, narrative voice, overall structure (and a bit of fact checking, too). This is done once the story itself is complete and it’s time to make sure the words say what the author means and that the sentences flow smoothly. I know the difference between bland-and-boring passive writing and the necessary use of to be verbs; there are times when these verbs are the better choice. I’m not afraid of sentence fragments. Love ‘em, in fact. Sometimes, anyway, when they suit the narrative voice. I know that the “Rule of Adverb Avoidance” is both ridiculous and impossible to follow because words like not and however are adverbs, too, but I also know that adding an -ly adverb to the tag for every line of dialogue isn’t good writing. I know the proper use of semicolons. I know the difference between a kilt and a kirtle. I know that it is, in fact, much easier to hit a person wearing plate armor than it is to hit that same person when they’re wearing light leather. I know that flaxen refers to the color of unbleached linen, not to the color of flax blossoms. I know all the standard uses of italics. I know how to use hyphens. I know that Earth is not the “only planet in the galaxy,” nor even the only one of its type. I know that a telepath can’t turn on a light bulb with her mind (unless she’s also a telekinetic), nor can she see the future. Rates: My usual rate for combined line editing/proofreading is $4/page (page = 250 words), although I am willing to negotiate on a case-by-case basis. I offer free sample editing on up to 3,000 words of a novel manuscript. There should be testimonials from happy clients somewhere on here, right? Once upon a time, I edited a ginormous fantasy tome titled In Siege of Daylight. This is what the author had to say (on his own blog) about having me edit his novel.